A good indication your dog is bored is that you don’t come back to the same house in the evening that you left in the morning. 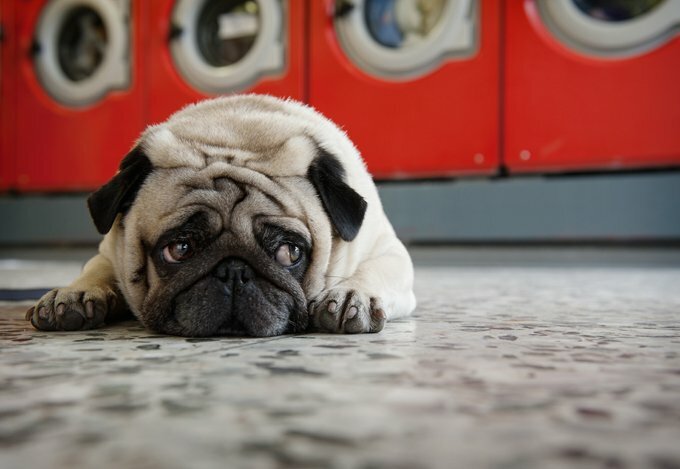 A bored dog is likely to be a destructive dog–chewing up curtains, tearing up rugs, or worse. Though you might think she’s doing these things to punish you, in fact, that’s never the case. Dogs simply become extremely frustrated without physical or mental stimulation–a bored dog is frequently an under-exercised dog. The reality is that most of us have to work during the day, so if you can’t spend hours and hours at a time with your dog, make sure the time you do spend with her is quality time. Walk her in the morning. Go to the park and toss the ball 50 times. Take her for a run at night or hikes on the weekend. Whatever she likes to do, find a way to fit it into your schedule. And remember, don’t make a big deal of coming and going–drawn out, dramatic goodbyes will only amp her up. The same goes for when you greet her. Say hello calmly so as not to encourage jumping or over-excitement. Establish some type of routine your dog gets used to what happens when you come home–when she sees that you’re settled, she will do the same. One other note: Boredom should not be confused with separation anxiety–a very serious condition in which your dog is highly stressed or even panicked by your absence. Call a professional if you think this might be the issue.